Gavin Reid recently presented a paper (6th June 2013) on pricing in various market structures to Members of the Competition Appeal Tribunal (CAT). This presentation considered: basic models for market structures; standards by which to judge economic efficiency; collusive and non-collusive oligopoly; two models of oligopoly (partial monopoly/price leadership and the kinked demand curve); and modern developments of the kinked demand curve and Edgeworth cycles. It was illustrated with hand-drawn diagrams, and reference to empirical work (e.g. M. Noel, 2007, Edgeworth price cycles, cost-based pricing and sticky pricing in gasoline retail markets, Review of Economics and Statistics, 89, 324-334). The CAT considers appeals, in a High Court setting, that arise from decisions of the Office of Fair Trading (OFT), sectoral regulators (e.g. OFCOM, the communications regulator), and the Competition Commission (e.g. on takeovers that may have implications for market dominance or the lessening of competition). As a Member of the CAT, Gavin Reid was recently involved in the case of Akzo Nobel NV v. Competition Commission, working with the Hon Mr Justice Norris and William Allan (18th and 19th April 2013). See e.g. 1204/4/8/13 Akzo Nobel N.V. – Transcript of hearing (Day 2)|19 April 2013. Two members of CRIEFF, Professor Gavin C Reid and Professor David T Ulph, were participants in the recent SAEF meeting held in the Golf Hotel, St Andrews, February 9th – 10th, 2013. Professor Reid spoke on the topic of ‘Attitudes to Risk, and the Potential Role of Informal Investors in Inclusive Innovation‘, and Professor Ulph chaired a session on the ‘Economics of Innovation in Developing Countries’. The St Andrews Economic Forum (SAEF), founded by students of the School of Economics & Finance in 2008, is a student-led organization that provides a forum for the discussion of contemporary economic issues of global significance. This forum gathers together world experts to expound and debate such issues, at a level that is accessible to specialists and non-specialists alike. The meeting is held over a week-end, with all the leading authorities resident in St Andrews, and available for formal and informal discussion throughout this period. This year the SAEF meeting focused on the topic of Inclusive Innovation, a topic that has been highlighted by the World Bank and the OECD (among other organizations) as one of the most important contemporary issues in developing economies. For SAEF 2013 the list of speakers included: Jonathan Feinstein, John G Searle Professor of Economics and Management, Yale University; Pierre Mohnen, Professor of the Microeconometrics of Technical Change, Maastricht University; Yuko Harayama, Professor, Graduate School of Engineering, Tohoku University; and Jaideep Prabhu, Jawaharlal Nehru Professor of Indian Business & Enterprise, Judge Business School, University of Cambridge; Gavin C Reid, Professor in Economics & Finance, Director of CRIEFF, School of Economics & Finance, University of St Andrews; and Norman Scott, Professor Emeritus in Bioengineering, Cornell University. Professor Gavin C Reid, Director of CRIEFF, was the opening speaker at the ‘Opening Doors to Innovation’ event organized jointly by the University of St Andrews’ Knowledge Transfer Centre and the Fife Economic Partnership on the 7th November 2012. This initiative aims to be compatible with the Scottish government’s strategy for innovation in the small and medium sized firm (SME) sector (e.g. SPPN 03/2005). The broad aim is to create a kind of ‘business ecosystem’, in the sense of Moore (1993), that identifies, and stimulates, mutual interests between business and industry, and both educational (e.g. colleges, universities) and enterprise services (e.g. regional council economic planning, local enterprise trusts). Professor Reid spoke about research conducted within CRIEFF into high-tech enterprise and entrepreneurship in Scotland. This CRIEFF project focussed on the high tech sectors of software, life sciences, microelectronics, optoelectronics, and digital media. This evidence indicated that Scottish high tech firms had four key attributes: they were small, knowledge intensive, research intensive, and internationalised. A computer ‘model’ of the Scottish high tech firm was created from field work, questionnaire and interview evidence on over 800 Scottish SMEs. This model used a cross section of evidence, to which a dynamic element was added, allowing the model to trace the evolution over time of the typical Scottish high tech small firm. This model had three major findings. (a) It found, in the short run, an equilibrium firm size of about 100 employees. (b) Further, it found that, in the medium-run, the optimum size of a high-tech firm in Scotland, in the sense of maximising innovative intensity, was large – as great as 1000 employees. (c) Finally, it found that, to exploit the so called ‘Schumpeterian Effect’, of potentially unlimited scale economies in innovation, firms had to be much larger still – in excess of 3000 employees. The work concludes that, very often, high tech firms would find it hard to achieve this kind of growth through internally driven forces, like ploughing back profits. Instead, they would need to achieve such rapid growth by merger, acquisition, trade sale, joint ventures, etc. rather than just by retentions. A consequence of this would often be the dilution of the entrepreneur’s interest in the firm: certainly in an economic sense, and probably also in a motivational sense. Morten Dyrmose has successfully defended his doctoral thesis on ‘Markets and How They Work’. This thesis is a major work on the efficacy of markets worldwide. It uses a detected anomaly in financial market pricing as a barometer of failure in corporate governance, to explore wider causes of market inefficiency, both quantitatively and qualitatively. The quantitative work analyses market inefficiency in a cross section of forty five nations world-wide. It finds extreme anomalies in Russia, India and China. It follows up this quantitative work with qualitative work, based on fieldwork in Russia, China and India. This further explains the nature of the forces behind these anomalies, emphasising board composition, information flows, the judicial system, the stock exchange, and financial regulators. The examiners were Professors Simon Deakin (Cambridge) and Professor Felix FitzRoy (St Andrews), and the research supervisor was Professor Gavin C Reid (Director, CRIEFF). An accessible summary account of its principal findings is in M. Dyrmose (2012) ‘India, Russia, and China: a comparative analysis from the field’, The State Bank of India Monthly Review, May 2012, pp. 19-24. 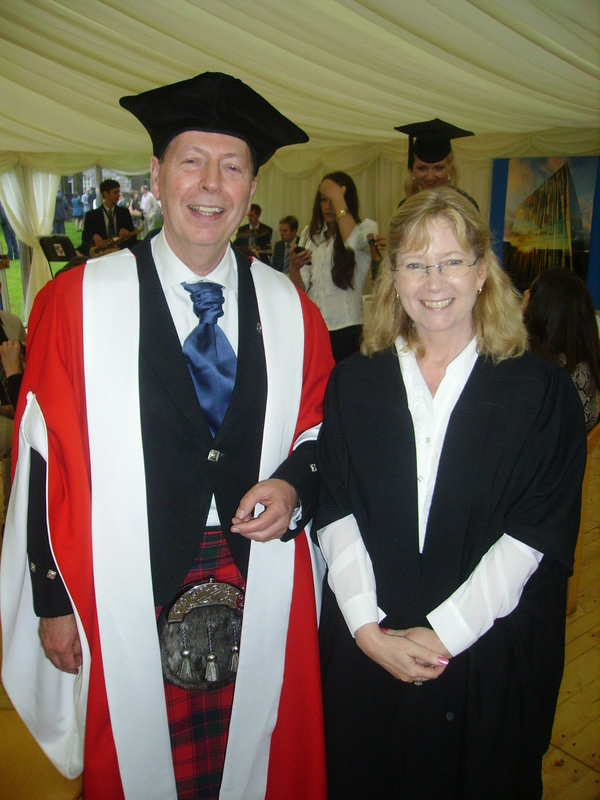 On the 2nd July 2012, Professor Gavin C Reid, Director of CRIEFF, was awarded a DLitt by the University of Aberdeen for his published research work on small business enterprise. This higher doctorate is awarded for ‘an original and substantial contribution to humane learning’ and in this case it was externally examined by three distinguished international authorities. In putting forward his portfolio of a lifetime’s publications, Professor Reid themed his connecting narrative around his well-known publication Small Business Enterprise: an Economic Analysis, relating it to both his previous and subsequent works. The graduation was a doubly happy occasion, as this is the second time Professor Reid has graduated from Aberdeen University. The first occasion was in 1969, when he graduated MA Economics Science with First Class Honours. Of his second occasion of graduation he said: ‘It was a great pleasure to have friends and family around me on this occasion, and it evoked very happy memories of nearly fifty years ago when I first went up to Aberdeen University to study economics. I had a tremendous education, which has stood me in good stead ever since, but more than this it turned me on to a life of scholarship and research which has been, and continues to be, the cornerstone of my existence’.